Autumn rolls around again, with its vibrant hues, misty mornings with that certain special smell in the English air and then it’s certainly time to set off for the annual European Doula Network conference! This year was hosted by the Polish doula association ‘Doula w Polsce,‘ in Warsaw. The European Doula Network hosts a conference every year, bringing together doulas from all over the world to share stories, tears and laughter to support each other in our doula journey. We learn and share and come away bigger and bolder than ever before…ready to change the world! It’s a real melting pot of languages, customs and reflection of birth culture from all over Europe. In Poland there is one doula association that was formed in 2011 (although the first training was in 2009). They do 2-3 trainings per year and it is a year long course. There are approximately 170 doulas, mostly in Warsaw, with 30 certified doulas. In 1997 there were just three lay doulas. In 2007 doula training was organised by midwives, but it wasn’t appropriate scope of practice for doulas. In 2010, DONA doula training came from The United States and the Greek doulas formed an official organisation. Since 2012 the Greek Doula Association has been doing its own training for new doulas. The current birth situation in Greece is a high rate of medicalised and traumatic births with a growing number of traumatised mothers wanting to become doulas. There are signs of difficulties between doulas which includes competition, isolation and giving up. Doulas are mostly not accepted in hospitals due to midwives’ hostility/suspiciousness. Find our more via the Greek Doula Association’s website: www.mitrotita.org. The Swiss doula movement is twenty years old and works across four language groups (French, German, Italian and Romanish). There are currently challenges with internal politics and a big question for them is: should doulas be mothers? This is a small country with an even smaller representation as this doula only covered the Flemish speaking north of the country, the south is covered by different doula association who work in French, but were not present at this meeting. There are difficulties in France because being a doula is not officially recognised as a profession and doulas need to be very careful about how they work. Some doulas do not respect the law or do not know their limitations so they are illegally practising medicine. There has been an organized doula association in Croatia since 2013, training over 100 doulas. The association now has 20 members. Doulas can work in hospital births, as doulas or companions. There are two associations with different doula programs (one and two years’ long in 6 or 12 weekends respectively). You can only be a member of the association you do the training with. They also have an ‘association doula card’ with the status of doula to show hospitals if the doula is a student or recognised. In Germany there are two well established doula associations. We heard from the Doulas in Deutchland (DID) representative that this association has been running since 2008 and has 160 members, with around 50 actively working. Their training is one year long and covers birth and postpartum. Not everyone who does the course goes onto become certified, which takes a further 18 months. In 2016 there were 160 births in Germany accompanied by a DID doula. This is a big country but it has a low population (340,000 approx) and has a low birth rate – there are more deaths than births! The country has one birth centre and a 2% homebirth rate. Doulas are not allowed in hospitals, only one birth companion is allowed. The representatives from Spain found it quite amusing to share that they are originally from Argentina and Uruguay, although they have both made Barcelona their home! There is also a Russian Doula Association who are not members of the EDN. Austria is a landlocked country in the middle of Europe. 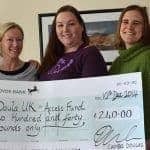 Angelika Rodler was the first doula, who founded doula training and in 2006 the Austrian doula association Doulas in Austria – DIA. Angelika’s beautiful space was built in 2012 (http://elysia.at/ueber-uns). There have been 400-500 trained doulas, 60 of whom are currently actively attending births. Campaign idea: an active doula not only attends birth but also talks to women about birth. The European Doula Network is an umbrella organisation for associations and doula trainings. Membership is about exchanging experiences. Learning from each other, optimising work and growing in quality and number and to raise the profile of the work of doulas across Europe and beyond. All members of Doula UK are automatically members of the European Doula Network. If you are not a Doula UK member and want to join the network you are welcome to join individually as a ‘friend’. The annual EDN conferences have been well attended by the delegates from member organisations, with more joining each year. Now the doors have been flung wide open to make sure that every member of each organisation that is part of the EDN knows they are invited and very welcome to join as well. Tempted? See you on the 21st – 23rd September 2018 in Vienna, Austria! Tickets to the conference generally cost under 200 euros and include all workshops and food from Friday evening to Sunday (but not accommodation) and will go on sale soon. Follow the EDN page on Facebook or join the mailing list via the website to stay connected.